I'm a comedian. I'm a writer. I'm a relationship ruiner. Which I realize isn't a real word, but it accurately describes what I do to other people. Which is ruin them. Sorry. 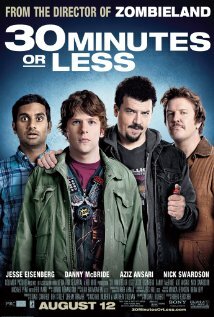 Posted on August 15, 2011, in Movie Madness, Reviews and tagged 30 minutes or less, aziz ansari, danny mcbride, jesse eisenberg, nick swardson, review. Bookmark the permalink. Leave a comment.